I decided to start the new fonts on these labels. I figure this gives me a chance to see what seems to fit just right and helps me to decide if I want to use certain fonts for lines, specific products, or what. I totally love the variety on the labels. I think they give whimsical and professional vibes to the products, too. 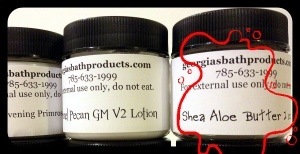 I’m so tickled with the font used for the strawberry jam and then I think the one for the Shea has a great multipurpose look to it, so I helped draw the eye to it just a tiny bit. Lol. I’m really proud of completing the near 100 oz order in a timely manner for once (thank you cold for giving me that little break!) and that I’m doing doggone well at breaking out of my narrowed tried and true habits. Only thing I really need to get seriously focused on is the cancer walk event, so I think I’ll try to reblog the first poll that went silent. For now I will set the concerns and projects aside and I hope that you get to set aside your burdens to enjoy family, friends, fireworks, and yummy food. My thanks go out to those that protect my ability to enjoy the day and I wish everyone a very happy, and safe, 4th! 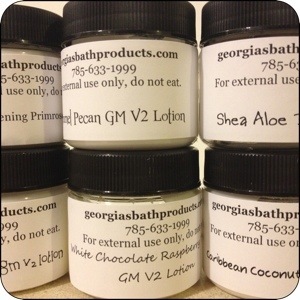 Posted in Bath Products (non-soap) and tagged bath, handmade, spa. Bookmark the permalink.